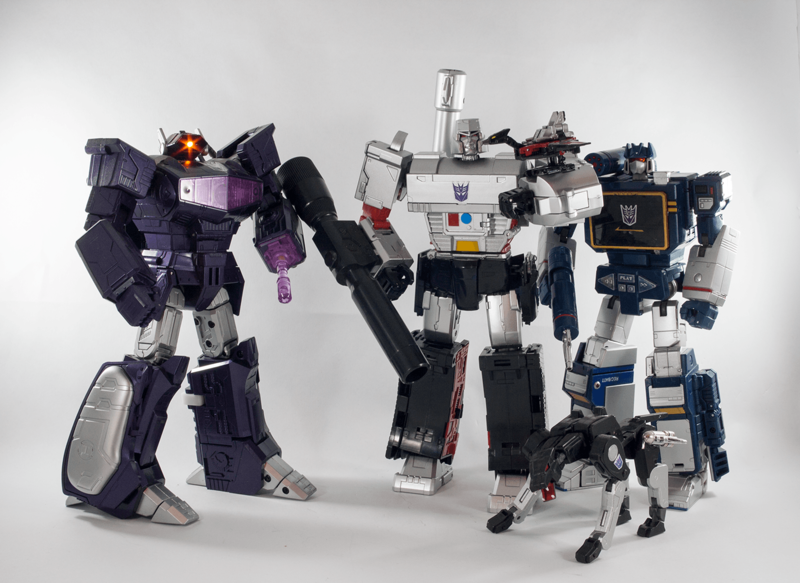 MakeToys Despotron as Megatron, Cloud 9 Quakeblast as Shockwave, MP 13 Soundwave and Laserbeak, and MMC Jaguar as Ravage. 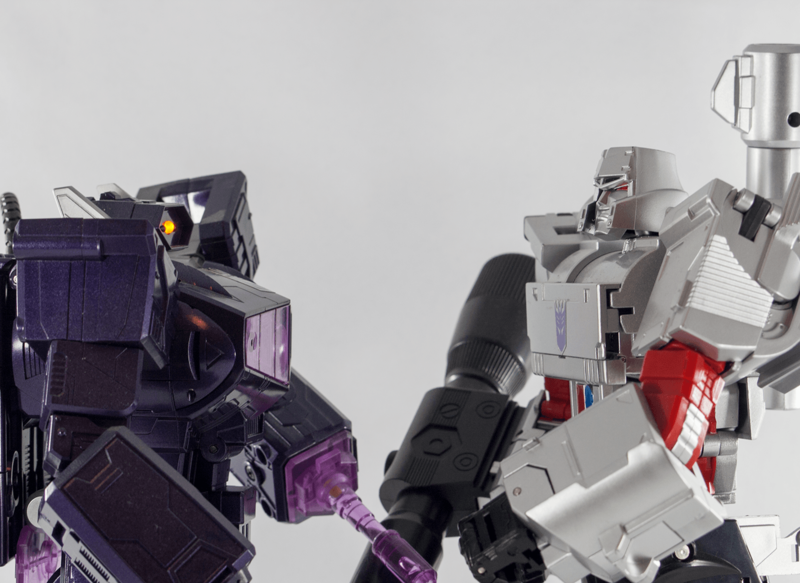 Who should sit in the top slots in the Decepticon chain of command. Of course Megatron slides in to the top spot, it’s easy and obvious, just as easy as it is place Shockwave besides him. A faithful and logical servant, Soundwave belongs alongside these two as a second in command to keep unruly troops in order. At this point you may be expecting Starscream to round out the top ranks, but for me he never makes it up there. Distrusted and forever ready to stab others in the back, he is not a leadership figure. For me, Soundwave’s top spies of Ravage and Laserbeak are who enable the Decepicon ornisation to function and deserve seats at the top table. Megatron. 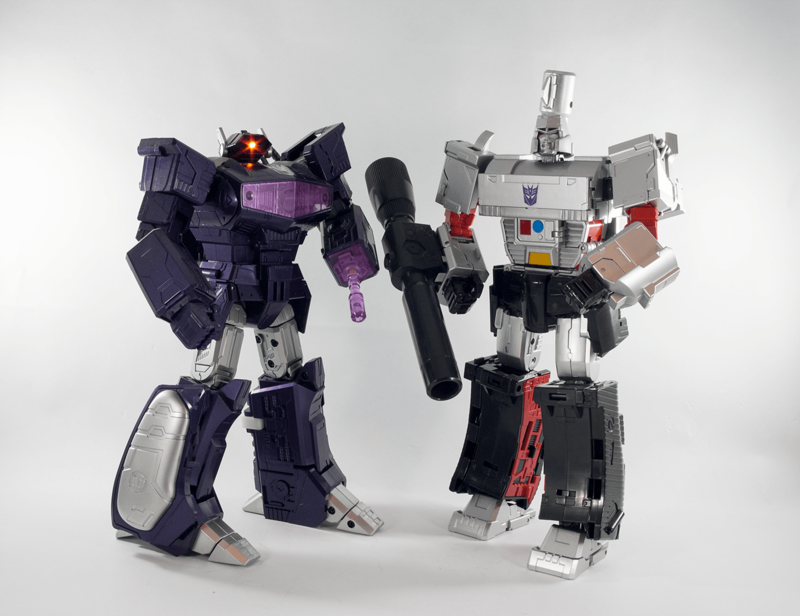 For me, the newest Megatron iteration in MP36 doesn’t quite capture the character as I hold him in my minds eye. His body is too short and his pants too big! I am therefore very happy that MakeToys have given me Despotron to take that space on the shelf. 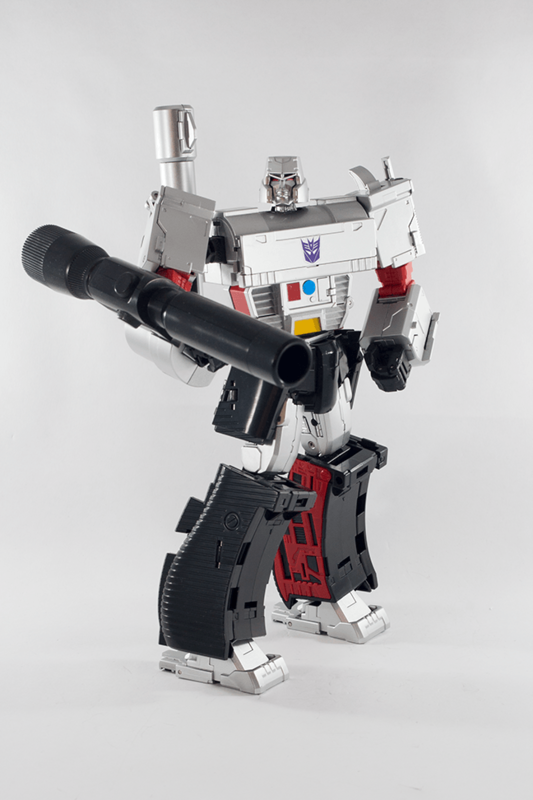 Meaty and strong, with a smart fold up chest to stash the trigger section he captures just what I think Megatron should be. 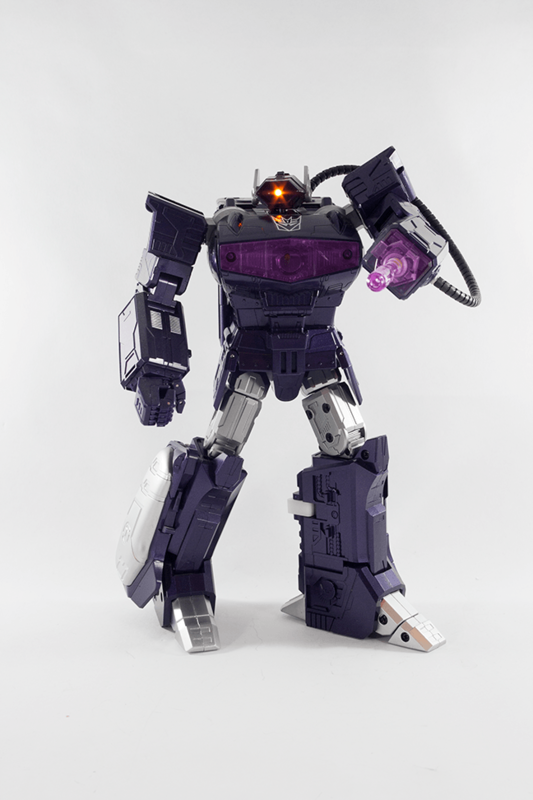 Shockwave is represented by Cloud 9s Quakeblast with a transformation as old as Transformers go. He is beefier and carries a more ominous deep purple colour scheme than the Masterpiece MP29 Laserwave, exactly as I remember him from the Transformers comics. Sometimes a toy comes along early enough, that nails a character so hard it seems futile for another company to attempt to compete. This is the case with MP13 Soundwave. A bot mode that fits every aspect of the sinister communications officer, and an alt mode that works on multiple levels I can’t see why I would ever feel a desire to replace him. Not only that but he comes packed with the toy that could possibly be the greatest transformation on my shelves in Laserbeak. To go from a correctly sized mini cassette to a perfectly formed bot in such a tiny package is unbeatable in my eyes. 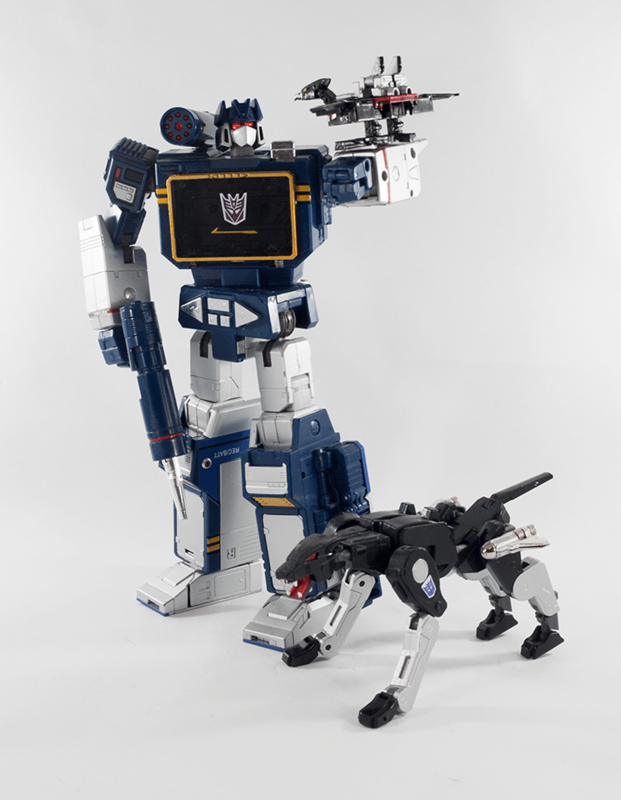 And finally, Ravage. Shown here in the form of MMC Jaguar, a full sized cassette alt mode breaks compatibility with Soundwave but in return we get a cat with magnificent articulation and in a scale that fits with the Masterpiece bot size much better than the official Ravage figure. I enjoyed seeing this toy on my shelf so much each day I grabbed another to keep on my desk at work!